One of Russia 's leading choirs, the St. Petersburg Chamber Choir is actively involved in continuing the rich traditions of Russian and European vocal music. Founded in 1977, the choir is made up of professional musicians who have completed their studies at Russia 's top musical institutions. Besides receiving numerous national awards, it has excelled in the international arena, winning prizes in Hungary in 1986 and in Germany and Italy in 1989. In 1994 the choir was awarded a Grammy for the best Choral Performance of the Vespers by Sergei Rachmaninov. On the back of these successes the choir has launched an extensive international touring career, and has received widespread critical acclaim in the United States, the United Kingdom and continental Europe. The choir's broad repertoire includes Renaissance music, Bach's sacred compositions, nineteenth-century music and contemporary works, many of which were composed for the choir. In this way the choir has attracted the attention of many well-known conductors and soloists. Over the years such conductors as Gennady Roshdestvensky, Yury Simonov, Semyon Bychkov, Valery Gergiev, Mikhail Pletnev and Sir Georg Solti have worked with the ensemble. In 2000 the choir performed the world première of St John's Passion by Sofia Gubaidulina. The choir participates in all the significant musical festivals in St. Petersburg . 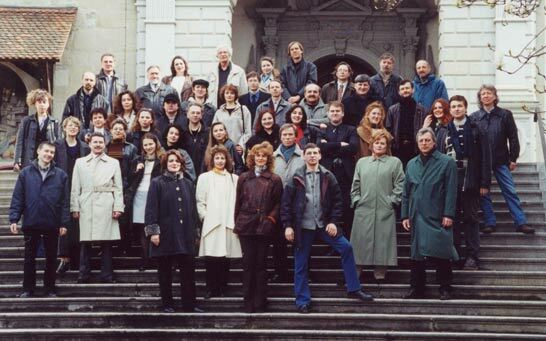 Valery Gergiev invited the choir to perform at the White Nights Festival in St. Petersburg in the summer of 1994 for the first time. The choir tours extensively in Europe and regularly visits the United States In 1999 they performed in Switzerland , France , Germany , the United Kingdom and Italy . In 2000 they appeared in Finland , returned to Switzerland , Italy and France and completed their successful tour in the Netherlands . In 2001 and 2002 they were invited to Lucerne Easter Festival, they returned to the United States , and appeared in Canada at the Toronto Choir Festival in June 2002 for the first time. In Summer 2002 the choir performed in Italy at the important Festivals of Bergamo, Brescia and Citta di Castello. The concerts in December 2002 were in Germany, Holland, Belgium and Switzerland and in December 2004 they returned to Italy. Nikolai Kornev was born in St. Petersburg in 1948. He received his musical education at the Michael Glinka College of Music, the oldest choir school in Russia. In 1971 Nikolai Kornev obtained the Diploma of Conducting at the Conservatoire of St. Petersburg. Since 1974 Nikolai Kornev has been teaching at the Department of Conducting at the St. Peterburg Academy of Culture and at the N. Rimskij-Korsakow Conservatoire in St. Petersburg. Nikolai Kornev is the founder and artistic director of the already internationally renowned St. Petersburg International Festival of Choir Music. Since 1992 the choir conducted by Nikolai Kornev has been collaborating successfully with Philips. 10 CDs have been made, 7 of which with church music of Russian composers of the 19th and 20th centuries. Sergeij Rachmaninov's Vesper Mass won the special Grammy Award. The work of Nikolai Kornev and his choir have received several State Prizes and Awards. In 1997 Nikolai Kornev was honoured with the title of "Russian Artist of Merit". Alleluia Behold The Bridegroom - Anon. 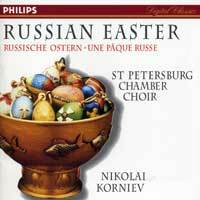 St. Petersburg Chamber Choir and their director, Nikolai Korniev, show off subbasement basses, soaring sopranos and a rich, well-blended sound in "Russian Easter," a group of eleven settings for Easter worship by Alexander Grechaninov, Dmitri Bortnyansky and other masters of Russian church music. The compositions were written variously from the 18th century through the present, but all stay true to the spirit and aesthetic of the Orthodox tradition. Those who find plainchant a little on the monotonous side but are still looking for a spiritual element in music will find much to admire and enjoy in these beautifully sung presentations. The Orthodox Christians of Russia have long celebrated the great mid-winter feast of the Nativity, a time of intense fasting and prayer followed by feasting. The St. Petersburg Chamber Choir brings us little-known choral music by composers such as Aleksandr Grechaninov (1864-1956) "Voskliknite Gospodevi vsya zemlya, Op. 19 No. 2," and Pavel Chesnokov (1877-1944) " No. 1 "Presvyataya Bogoroditse" and anonymous composers ("Dobr'ii vechir Tobi," "Pavochka khodit" and "Nova radist' stala") that tell the Christmas story from the traditions of the Russian Orthodox Church. There are 20 beautiful, intense, soaring selections here, especially from mezzo-soprano soloist Olga Borodina.